For delicious popcorn ready to eat in 3-5 minutes, choose this Pretty Pink Popcorn Maker, ideal for movie nights at home. With hot air circulation, theres no need for added oil so you get the awesome taste of popcorn, with less calories; Try dipping your popcorn in the Pretty Pink Chocolate Fountain for the ultimate indulgence. 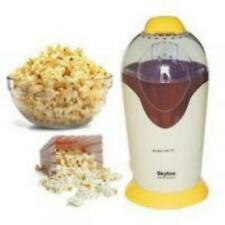 Includes Popcorn maker, lid and scoop. Does not include ingredients. Design may vary. For ages 14 years and over. Makes hot, tasty popcorn in less than three minutes. Perfect for parties or movie nights. 1100 watts. Makes up to 40ml of popcorn in 3 minutes. Size H30.5, W15, D18cm. Includes user instructions. Make yourself and your friends delicious popcorn and crepes quickly and easily. The non-stick, easy to clean cooking plate means you can use it quicker with minimal cleaning. The set includes measuring tools, a batter spreader and a pop n; serve bowl. 800 watts. 6 minutes. Size H14.5, W21, D40cm. Includes user instructions. The ultimate dessert maker. Create waffles, donuts and cakepops all with one machine by choosing from one of the three detachable cooking plates. The plates are non-stick coated, making them easy to clean. The automatic temperature control and the ready light means your treats will be baked to perfection every time. 600 watts. Removable cooking plates makes cleaning easier. Versitile - makes 9 cake pops, 4 doughnuts or 1 waffle. Non stick coated cooking plates making unit easier to clean. Includes 3 sets of removable plates, an instruction manual including recipes. Size H10, W16, D23cm. Weight 1.8 kg. Featuring a classic retro design inspired by the 1950s, this popcorn maker can be ideal for preparing this popular snack at home Size: Large. Colour: Red. Gender: Unisex. Age Group: Adult. Supplied in an elegant branded box, this bracelet can be an ideal gift for anniversaries, graduations or other special days Size: Osfm. Colour: Gray. Gender: Unisex. Age Group: Adult. Treat yourself regularly to delicious home-made ice cream and sorbets with this Magimix Le Glacier ice cream maker. Featuring large feeding tube and stainless steel bowl it does all the hard work for you, guests will be impressed. Makes 1.5 pints of ice cream. Stainless steel bowl. Pre-freeze bowl for 8 - 12 hours. Instructions included. Easy to clean. Argos.co.uk Adoration - Sterling Silver - Popcorn Bead Necklace. Elegant 925 Silver Italian handcrafted braided Popcorn and diamond/Cut bead chain necklace. An adjuster silver chain extender allows a perfect fit for any neck. Part of the Italian Silver collection. Sterling silver popcorn chain. Length of chain 41.15cm/16.2in. Hollow chain. Packed full of flavour using the very best ingredients to deliver a fresh, new and exciting coffee experience. Size: Large. Colour: Red/Brown. Gender: Unisex. Age Group: Adult. Argos.co.uk Adoration - Sterling Silver - Popcorn Bead Bracelet. Your jewellery box will dazzle with this elegant 925 sterling silver Italian handcrafted bracelet. Designed with braided popcorn and diamond cut beads, this bracelet is the icing on the cake for any glamorous outfit. A beautiful gift for someone special, with a silver chain extender allowing a perfect fit on any wrist. Revere. Part of the Italian Silver collection. Sterling silver. Length of bracelet 17.78cm/7in. 3mm thickness. Solid chain.